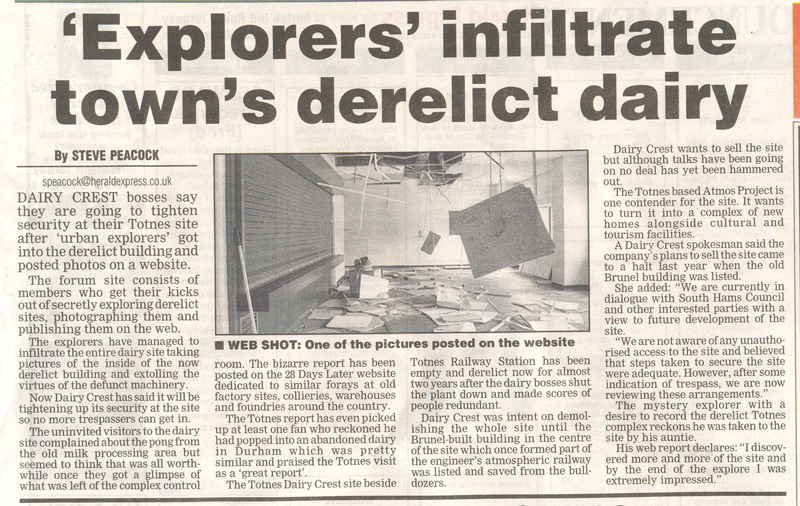 DAIRY CREST bosses say they are going to tighten security at their Totnes site after 'urban explorers' got into the derelict building and posted photos on a website. The bizarre report has been posted on the 28 Days Later website dedicated to similar forays at old factory sites, collieries, warehouses and foundries around the country. Clebby, none of your pics on the online version - but I'd check the local rag to see if they have nicked any. p.s even your Auntie gets a mention! The mystery explorer with a desire to record the derelict Totnes complex reckons he was taken to the site by his auntie. There is a single picture in the paper taken from here on page 3! i love the "everyone has a hobby bit" I'm tempted to post a bit on there, and conclude with "dont worry yourself and go and collect your bottle tops"
Dairy Crest has said it will be tightening up its security at the site so no more trespassers can get in. In russia, lady pays YOU! I was asked for the newspaper cutting, I did post it but it's not here? ?